Trees are less susceptible to insect and disease infestation. Wound closure will be rapid and most insects and diseases are not active during winter months. Trees pruned during winter avoid mid-season stress and have all the stored energy to vigorously grow come springtime. Arborists can view the structure of the tree better without leaves. 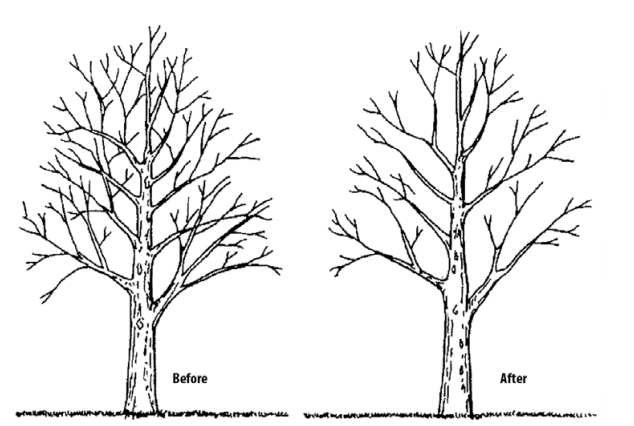 This means that trees pruned in the winter months benefit from improved structure as a result of increase visibility. In certain cases, equipment has better access during winter months due to harder ground. This means trees are more accessible and can be pruned more efficiently in the winter months. Those along the front range know that we get most of our heavy wet snow in March and April. Getting your pruning done before that time will remove hazardous limbs and reduce breakage during snow events. Remember: Trained arborists can easily tell the difference between living and dead limbs even in the winter months.